I reviewed The Seasons of My Mother: A Memoir of Love, Family, and Flowers (Atria Books) by Marcia Gay Harden for Lone Star Literary Life. "By turns gentle and fierce, elegiac and exuberant, The Seasons of My Mother is a loving tribute to Harden’s mother, Beverly, who was diagnosed with Alzheimer’s disease." My mother thinks herself timid. This is incorrect. I confess to teenage contempt at what I (mis)perceived as weakness. In truth my mother was strong, knocked down by circumstances never contemplated or prepared for, and got back up, repeatedly. The most affecting passages in The Seasons of My Mother concern the transformation of the mother-daughter relationship into something closer to friendship. I think my mother and I are doing that now, acknowledging a more equal footing. 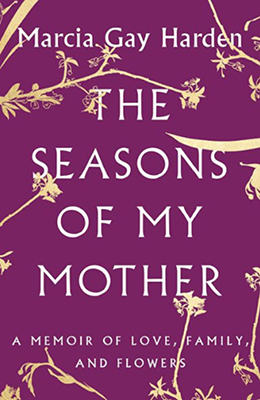 The Seasons of My Mother: A Memoir of Love, Family, and Flowers is the first book from actress Marcia Gay Harden, winner of an Academy Award for Best Supporting Actress for Pollock (Sony Pictures, 2000), and a Tony Award for Best Actress in a Play for God of Carnage (Yasmina Reza, 2006). By turns gentle and fierce, elegiac and exuberant, The Seasons of My Mother is a loving tribute to Harden’s mother, Beverly, who was diagnosed with Alzheimer’s disease. In chapters with titles such as, “My mother is an orange hibiscus in a brown coffee cup” and “My mother is a driftwood ballerina,” Harden remembers the seasons of her mother’s life because Beverly no longer can. With honesty, sensuosity, and self-deprecating humor, Harden introduces us to a nineteen-year-old bride who married a naval officer-in-training. During the next ten years, Beverly Harden gave birth to five children and followed her officer around the world. In Japan she learned the ancient Japanese art of flower-arranging called ikebana. Harden uses the concepts of ikebana to relate Beverly’s Texas roots, traditional rituals, and blossoming in Japan. Alzheimer’s is the invasive weed, the destructive nonnative species. Harden writes lyrically about the different kinds of memory — tactile, auditory, visual, emotional, atmospheric. Harden paid attention when Beverly talked about her beloved blooms. The Seasons of My Mother is an education and an inspiration in flora and the natural world, a celebration of the senses. A lovely volume, The Seasons of My Mother is wrapped in shades of lilac, symbolizing innocence, a reminder of first love, and confidence in the recipient of the flowers. The interior is graced by candid photos of Harden with her mom and delicate drawings of hardy flowers. Often spiritual, The Seasons of My Mother is Harden, in appreciation and admiration, stringing vignettes like pearls on a string. She tells us the story of Beverly becoming herself and then, not losing herself, but losing how she became herself, a homemaker in the truest sense, offering not sacrifices, but gifts. Here’s to all the mothers in my life. Thank you.